The largest demonstration during the Fantasyland Spring took place in front of the Ministry of Foreign Affairs. The Fantasyland Spring was a series of student demonstrations that took place during May 1970 within the Disneyland Confederation. The phrase “Fantasyland Spring” is a bit of a misnomer, as the demonstrations took place throughout all of the Disneyland nations. However, the largest demonstrations (and the ones gathering the most media attention) did take place in Fantasyland. The Fantasyland Spring demonstrations led to the end of military rule in Disneyland and the establishment of a civilian government. Through 1970, Disneyland had been a dictatorship for most of it years of modern independence. In 1956, just months after the signing of the Treaty of Corporation, Mickey Mouse the Great took power in the Coup de Rat. The subsequent years were marked by repression and an extreme cult of personality. Political dissent was brutally crushed and those opposing Mouse often disappeared. In late March 1970, Mouse became ill. (The nature of the illness continues to be a point of contention among historians. Some historians believe that Mouse became ill after an overdose of saccharine. Others believe that Mouse had suffered from a brain tumor.) As the illness progressed, the stage was set for dramatic political change within the Disneyland Confederation. Days after the passing of Mickey Mouse the Great, a local armed militia parades down Main Street in a show of power. On April 20, 1970, Mouse passed away at First Fantasyland Medical Hospital. Unfortunately, Mouse had designated no successor. As a result, almost immediately after Mouse’s death, various groups and factions within Disneyland began to vie for power. Just days after Mouse’s death, armed militias began parading down the streets of Disneyland’s large cities trying to seize control of the nation. Ethnic tensions that had been kept in check under Mouse’s rule erupted to the surface again. Some tribes within the confederation that had felt neglected under Mouse’s rule (in particular, the Tomorrodagas and the Beár) began pushing for outright independence. Amidst the spreading chaos, a military junta led by Admiral Donald Duck decided to impose order on the rapidly unraveling nation. On the Sunday of May 3, 1970, martial law was declared. 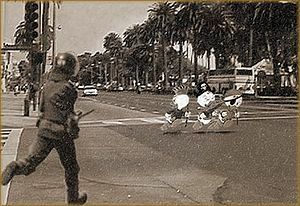 On May 23, 1970, Disneyland’s government ordered a crackdown on the protesters. Martial law, instead of creating order, spawned more unrest. It also gave impetus to a nascent democracy movement. On May 4, a small fringe student group, the Disneyland Liberation Society, began a peaceful protest against the imposition of martial law outside of the Ministry of Foreign Affairs. Soon other students joined the protest. Peaceful demonstrations by Disneyland citizens fed up with military rule and totalitarianism soon spread to all of the Disneyland nations. Within two weeks, hundreds of thousands of people were protesting military rule. 20,000 people alone joined the protest at the Ministry of Foreign Affairs. At first, the military junta ignored the protests, deciding to focus its attention on the violent local militias and various secession movements. However, by May 23, the protests had grown too large to ignore. Soldiers were ordered to crackdown on the protesters. The order to break up the protests soon created problems in the chain of command. Many soldiers refused to obey orders and joined the protesters. The morale among those who chose to follow the orders from the higher echelons of command sank into an abyss. On May 24, protesters at the Ministry of Foreign Affairs were startled to see Mickey Mouse, Jr., son of the late Mickey Mouse the Great, join their ranks. Mouse, Jr.’s participation in the protests galvanized the democracy movement. The international media flocked to the Ministry, interested in Mouse, Jr.’s personal story. Across the world, Mouse, Jr.’s face became the public face of the Fantasyland Spring protests. Within Disneyland, it soon became clear that military rule was unsustainable. Mouse, Jr.’s participation in the protests was the final nail in the coffin for military rule. On May 25, Admiral Donald Duck broadcast a message on the radio calling for reconciliation and negotiation. (At least, that is what most people believe—it was difficult to understand what Duck really said due to his speech impediment.) The following day, negotiations between leaders of the student protest and the military junta began. Admiral Donald Duck and student protesters negotiate an end to the unrest. 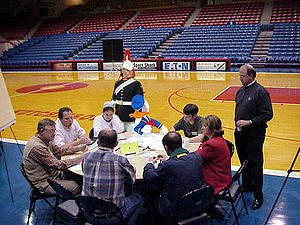 Student leaders met with Admiral Donald Duck and other military representatives over the course of five days. During the negotiations, the military agreed to immediately end martial law. A caretaker government was given powers until elections could be held. A general amnesty for both political dissidents and military careerists was also instituted. On the 30th, Donald Duck signed a paper releasing all political prisoners at the Mauschwitz prison camp, including, famously, the author Rafiki. By May 31, the participants in the negotiations announced their agreement. The military leaders, including Duck, agreed to resign their posts. A Great Council of democratically elected representatives was given power to rule Disneyland. A new judicial system would be established to keep the powers of the government in check. A new day of civilian rule had dawned. 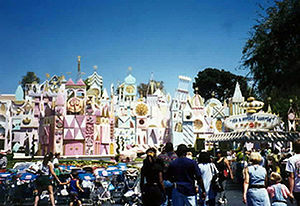 The Fantasyland Spring demonstrations peacefully brought Disneyland from dictatorship into democracy. 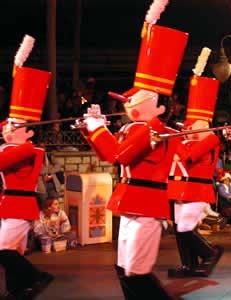 The negotiations that brought an end to military rule established many of Disneyland’s modern institutions. Mickey Mouse, Jr. became the public face of the new Disneyland. Soon after the the end of military rule, he toured the world, visiting many heads of state. Mouse, Jr. would later become one of Disneyland’s most well-known Minister of Foreign Affairs. Even today, people are inspired by the events that brought freedom to Disneyland. The Fantasyland Spring demonstrations are indeed a historical pinnacle of human decency and an example for future generations. This page was last edited on 28 May 2012, at 13:01.